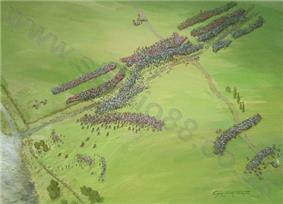 "Aerial perspective of the battle of Castagnaro showing the Paduan army, commanded by Sir John Hawkwood, outflanking and defeating the Veronese." The Battle of Castagnaro was fought on March 11, 1387 at Castagnaro (today's Veneto, northern Italy) between Verona and Padua. It is one of the most famous battles of the Italian condottieri age. Castagnaro is hailed as Sir John Hawkwood's greatest victory. Following a Fabian-like strategy, Hawkwood goaded the Veronese into attacking him on a field of his own choosing, by laying waste to the Veronese lands nearby. Drawing his forces up on the far side of a canal, and anchoring his right flank on a patch of woods, Hawkwood waited until the Veronese had committed to attacking across a ford of fascines piled up in the canal. Once so occupied, Hawkwood sprang his trap. Hawkwood had left a copy of his standard behind his forces, then had led his cavalry into the woods to his right. At a given signal — supposedly, a flaming arrow — the copy of his standard dropped, and Hawkwood's cavalry burst from the woods on the Veronese left, with his real standard in front. At the point of impact, Hawkwood is said to have cast his commander's baton into the Veronese ranks and ordered his men to retrieve it for him. Per Trease, it is said that Hawkwood's battle cry that day was a grim play on the Paduan war-cry of Carro! ("Cart! ", from the coat of arms of the House of Da Carrara) — in Hawkwood's rendition, it became Carne! ("Flesh!"). Curiously though, the Florentine reserves under Ischia stood their ground against Hawkwood's terrible onslaught. They could do nothing to turn the tide of battle since the Hawkwood's men were all heavily armed, whilst the peasants were not. Later republished: Leader, John Temple; Marcotti, Giuseppe (2005). Sir John Hawkwood (L'Acuto) story of a condottiere. Mansfield Centre, CT: Martino Pub.